牛津译林版 Unit1 Know yourself 单元测试题第一卷(共 50 分)一、选择填空(共 10 小题：每小题 1 分，满分 10 分)( ) 1. The performance was great success. The audience couldn t stop clappingtheir hands.A. a B. / C. the D. an( ) 2. Peter Paul like water-skiing very much.A. Neither; nor B. Either; or C. Not only; but also D. Both; and( ) 3. --Don t forget to give my best wishes to your parents.---________________ .A. OK, I don t B. OK, I won t C. Yes, I will D. OK, I will( ) 4. Not only Linda but also I out of breath at the end of last race.A. am B. was C. are D. were( ) 5. He broke the window, you I had anything to do with it.A. Neither; nor B. Either; or C. Not only; but also D. Both; and( ) 6. --What would you like, coffee or tea?--I m thirsty, juice _ water is OK.A. Neither; nor B. Either; or C. Not only; but also D. Both; and( ) 7. My friend Daniel has all kinds of different new ideas. He is very__________A. confident B. creative C. patient D. practical( ) 8. I think life on Mars is exciting I like life on Earth better.A. and B. so C. however D. but( ) 9. He speaks English French. Instead, he speaks German.A. neither; nor B. either; or C. both; and D. not only; but also ( ) 10. He never _ learning English. That was why he was successful at last.A. gave in B. gave out C. gave up D. gave away二、完形填空(共 10 小题：每小题 2 分，满分 20 分)Food is very important. Everyone needs to 11 well if they want to have a strong body. Our mind also needs a kind of food. This kind of food is 12 . We begin to get knowledge even 13 we are very young. Small children are 14 in everything around them. They lean 15 while they are watching and listening. When they are getting older, they begin to 16 storybooks, science books and so on--anything they like. When they find something new, they love to ask questions and _ 17 to find out answers. What is the best 18 to get knowledge? If we learn by ourselves, we will get 19 knowledge. If we are 20 getting answers from others and do not ask why, we will never learn welt. When we study in the right way, we will learn more and understand better. ( ) 11. A. sleep B. read C. drink D. eat( ) 12. A. sport B. exercise C. knowledge D. meat( ) 13. A.until B. when C. after D. so( ) 14. A. interested B. interesting C. weak D. practical( )15. A. none B. something C. nothing D. anything( )16. A. lend B. read C. learn D. write( )17. A. try B. have C. refuse D. wait( )18. A. place B. school C. way D. road( )19. A. little B. few C. many D. much( )20. 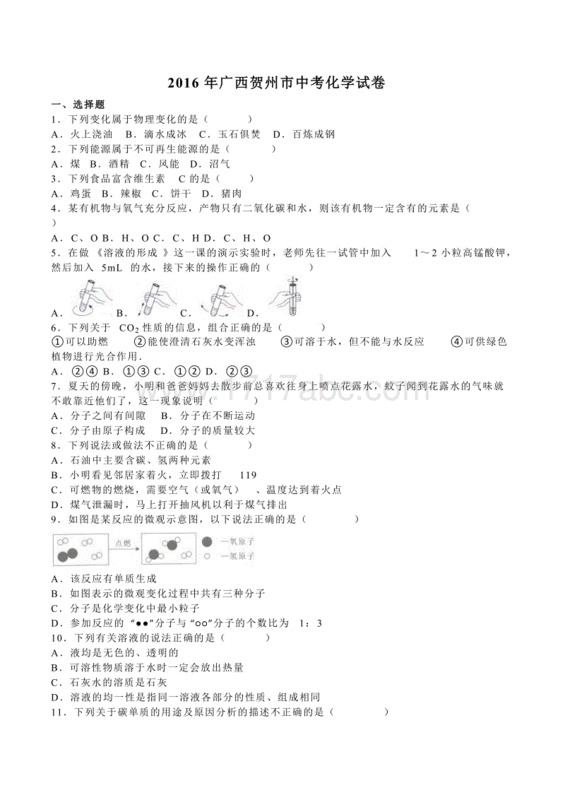 A. often B. always C. usually D. sometimes3、阅读理解(共 10 小题；每小题 2 分，满分 20 分)AScience has told us so much about the moon that it is quite easy to form an idea of what it would be like ifwe go there. It is certainly not a friendly place. As there is no air or water, there can be no life of any kind. Mile after mile there are only plains (平原) of dust with mountains around them. Above, the sun and stars shine in the black sky. If you step out of the mountains shadows, it will mean moving from terrible cold into great heat. The moon is also a very silent world, for sound waves (声波) can only travel through air. But from the moon, you can see a friendly sight. Our earth is shining more brightly than the stars. It looks like a large ball, coloured blue and green and brown. ( ) 21. What kind of place is the moon?A. It is a friendly place. B. It is a lively place.C. It is a nice place for man to live. D. It is a lifeless place. ( ) 22. Temperatures on the moon____________A. are usually the same everywhere B. are always very lowC. can be very different D. are usually very high( ) 23. The moon is a silent world because____________A. there is no life there B. there is no air thereC. there is no water there D. there is not a green tree there( ) 24. When we look from the moon, the sky is____________A. blue B. black C. green D. brown( ) 25. The underlined word “dust“ means ____________A. dump (垃圾堆) B. dry earth (土) C. land D. fieldBOne day when some government officials were rebuilding a barn (谷仓), they found a mouse hole in a comer and used smoke to force the mice inside the hole to come out. A while later they indeed saw mice running out, one after another. Then, everyone thought that all the mice had escaped. But just as they began to clean up, they saw two mice squeezing (挤) out at the mouth of the hole. With some efforts, the mice finally got out. However, it was strange that after they came out of the hole, they did not run away immediately. Instead, one chased after the other near the mouth of the hole. It seemed that one was trying to bite the tail of the other.Everyone was puzzled, so they stepped nearer to take a look. They realized that one of the mice was blind and could not see anything, and the other was trying to allow the blind mouse to bite on his tail so that he could pull the blind one with him to escape.After seeing what happened, everyone was speechless and lost in thought. During the mealtime, the group of people sat down in a circle and started to chat about what happened to the two mice.One serious American official said, “I think the relationship between those two mice was that of king and guard.“ The others thought for a while and said, “ That was why!” A smart Frenchman said, “I think the relationship between those two mice was that of husband and wife.“ Again the others thought for a while, and all felt it made sense. A Japanese said, “1 think the relationship between those two mice was that of mother and son.“ Once again the others thought for a while, and felt this was more reasonable. So they expressed agreement again.At that moment, one Chinese asked, “Why did those two mice have to have a certain relationship?“ Suddenly, the group looked back at the Chinese and remained speechless. The American official, the Frenchman and the Japanese who had spoken earlier were all lost in thought.In fact, true love is not built on friendship, loyalty or blood relationship. Instead, it is based on no relationship. ( ) 26. Neither of the two mice ran away immediately because____________.A. one was biting the other B. the mouth of the hole was too smallC. they were not afraid of smoke D. one was trying to help the blind one( ) 27. The underlined sentence “it made sense“ probably means “__________”.A. it was correct B. it was strange C. it was funny D. it was sweet( ) 28. Why were they lost in thought in the end according to the passage?A. They did not dare to answer.B. They were surprised at the relationship of the mice.C. They regretted (后悔) driving a poor blind mouse away.D. They did not express themselves much better. ( ) 29. It is clear that _________.A. both mice came out of the hole easilyB. each of the people understood the relationship differentlyC. the people wanted to kill the mice with smokeD. the people knew one of the mice was blind at first sight( ) 30. The best title for the passage is “______________”.A. Two lovely mice B. 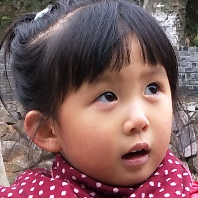 Help brings love C. Friends in need D. Love is all第二卷(共 50 分)四、词汇运用(共 15 小题：每小题 1 分，满分 15 分)A 根据括号中的中文提示、英文释义或句意，写出句中所缺单词。 31. My uncle is an (精力充沛的 businessman. He always works till midnight.32. Human beings are (有创造力的) animals.33. As we know, green (stand for) the growth of life.34. If you want to be a good teacher, you should be (feeling sure of one s own abilities) of yourself.35. My new dress is to yours, but they are not the same.B 用方框中所给单词的适当形式填空。36. I can t imagine the weak boy can be so strong and __________37. We think Millie is the person for the job of all.38. Now Susan has become than before. She doesn t forget the things she needs.39. You should not be __________ with your son. He s only five years old.40. The coat over there is the__________.C 用方框中所给动词的适当形式填空。41. You have to run faster because you behind.42. The doctor on a patient from 4:00 p.m. to 6:00 p.m. yesterday.43. She all of us with her perfect speech at the meeting last month.44. A year is into 12 months.45. They say everyone around her by her, especially the old.五、根据首字母提示完成短文(共 10 小题；每小题 1.5 分，满分 15 分)“Green“ is more than just a (46)c . It means that you should live to protect the (47)e --organize manage power suitable patientimpress fall respect divide operatethe water, the land and the air. You can be a green kid by following these steps.Reduce (减少) it. When you use less of something, you do a good thing for the Earth. For example, a shorter shower means you use (48)1 water. Turn off the water when you are (49)b your teeth.Reuse it. Many times, even if you don t need something, someone (50)e might just need it. For example, if your younger sister doesn t play with her toy bear any more, you can give it to your neighbour. Try to exchange (交换) books, toys, and even clothes with friends.Enjoy it. It s (51)t that pollution is a great problem now, (52)b the Earth is still a beautiful and interesting place to explore (探索). Go for a hike, visit nature centres and gardens, climb (53)m and take a boat in the rivers . Outdoor (54)a are good for you. You can also plant trees, collect reusable things . (55)B a green kid is so easy.46. 47. 48. 49. 50._____________51. 52. 53. 54. 55._____________六、书面表达(满分 20 分)假如你校正在选举学生会主席，你打算参加竞选。为了得到全校学生的支持，请你准备一篇音洗演讲稿。其中需包括以下内容：注意：对所给要点应做适当发挥．不少于 100 词。开头与结尾已给出，不计入总词数。Good morning, boys and girls! My name is Li Xiang. I think_______________________________________________________________________________________________________________________________________________________________________________________________________________________________________________________________________Please support me and vote for me. Thank you!牛津译林版 Unit1 Know yourself 单元测试题答案：一、1-5 ADBBA 6--10 BBDAC 三、11-- 15 DCBAB 16-20 BACDB二、 21-25 DCBBB 26-- 30 DADBD四、 A 31. energetic 32. creative 33. represents 34. confident 35. similarB 36. powerful 37. most suitable 38. more organized 39. impatient 40. manager sC 41. have fallen 42. was operating 43. impressed 44. divided 45. is respected五、 46. colour 47. environment 48. less 49. brushing 50. else51. true 52. but 53. mountains 54. activities 55. Being六、 Good morning,boys and girls! My name is Li Xiang. I think I have many strong qualities to be me new chairperson.I am open-minded, active and helpful. I always take an active part in after-school activities. When someone is in trouble, I m ready to help him/her. I get on well with everyone around me. My classmates say I am full of energy. Also, I am so hard-working that I often do some extra work after class. I am good at my lessons and do things in an organized way.If you choose me to be the chairperson, I will organize more different kinds of activities to make our school 性格 开朗，有活力，乐于助人能力 成绩好，与人相处融洽，勤奋，做事有条理计划 ……(自己发挥，至少两点)life more colourful. What s more, I will set up some clubs so that we can enjoy ourselves and learn from each other.Please support me and vote for me. Thank you!